I must admit that I am quite distracted this week. My son will be celebrating his sixth birthday on Friday, I will be attending Gen Con for the first time next week, and I have been prepping for my day job as students will be returning to campus soon. What I needed was a solid collection of books this week to give me an escape from everything that is happening here. I must say that the comic gods delivered. 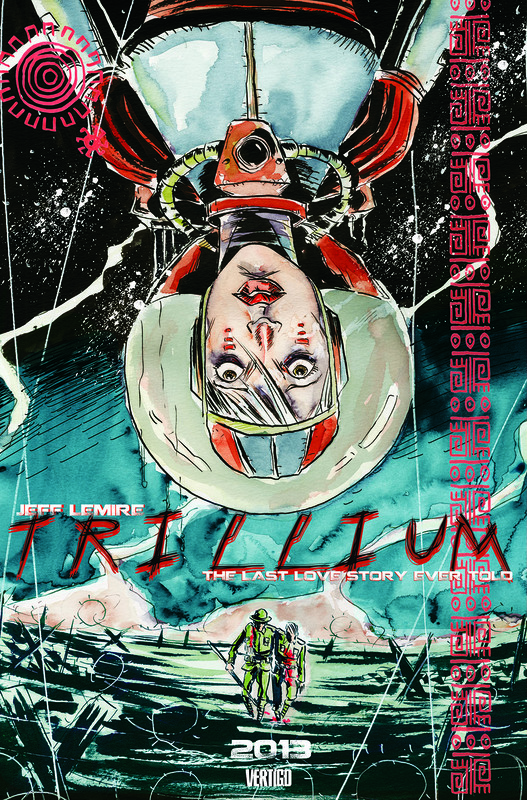 Trillium #1 - Jeff Lemire's science fiction epic Trillium debuted this week with high expectations. Lemire has never disappointed me in the past and his work continues to be simply stunning. What he does with his comics isn't fair to other creators. What moves me most with the work of Lemire is his ability to create intrigue and mystery through a simple facial expression, and how past relationships define who a character was and who they become. The premise of the book is that Nika, a scientist set to secure trillium flowers from an alien race, has had her timeline drastically reduced to complete her work for the good of humanity. At the center of the Atabithian village is a mysterious temple. William, a archaeologist who is suffering from war flashbacks, is from the past and is seeking an Incan temple of great power. Their two paths intersect in a way that is not only satisfying from a story standpoint, but from the process of reading the physical comic as well. Mild spoiler, but Lemire designed this comic as a flip book with a separate story for each character. Their point of meeting is at the middle of the book with reversed panels upside down from one another. Simply stunning. I had high hopes for Trillium, given how much I have enjoyed The Underwater Welder, Sweet Tooth, and Essex County, and it looks like Lemire is delivering another classic full on mystery and parental relationships. Well played sir. Burn to Lose: Burn the Orphanage - This title may be the polar opposite of Trillium. You can throw depth, mystery, and character development out the window for some good mindless fun. 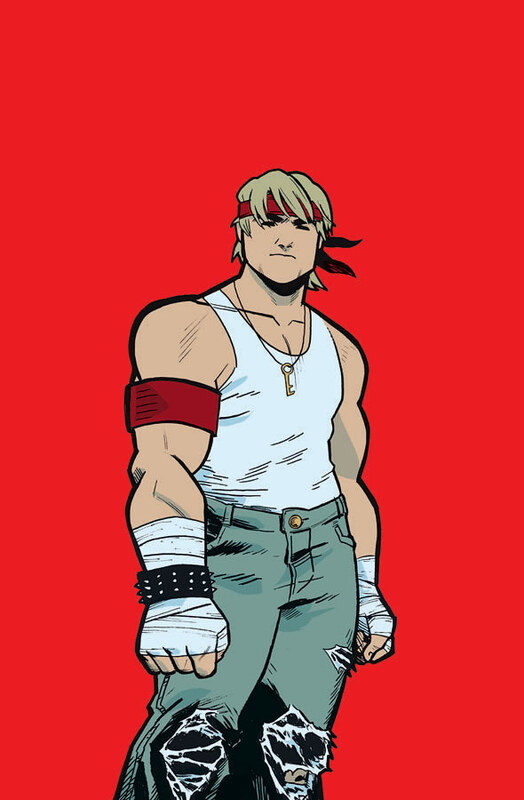 In this tale we learn that Rock, a cross between Ryu, Ken, and Johnny from the Karate Kid, was in an orphanage that was burned down when he was a kid. He was the only survivor and he is going to punch his way on the streets, in a bar, and against stripper ninjas to exact his revenge. Yep. That's about it. Robocop #1 - I guess they can't all be enjoyable. When I saw that Boom! Studios was releasing a new My brain saw Frank Miller + comic + Robocop = Gold! I should have listened to my friend who said he was excited initially, until he remember that Miller wrote Robocop 2. Based on a Miller script for Robocop 3, you may want to pass on this one. A clunky story paired together with subpar art and you have my $4 regret of the week. feud comes to its dramatic conclusion with twists that I did not see coming. Bunn really hits the nail on the head with his balance between horror and drama. Rikard's father plays a significant role and I fear for him in upcoming arcs. I don't want to spoil anything, but if you have missed this book so far you will want to pick up the trade. 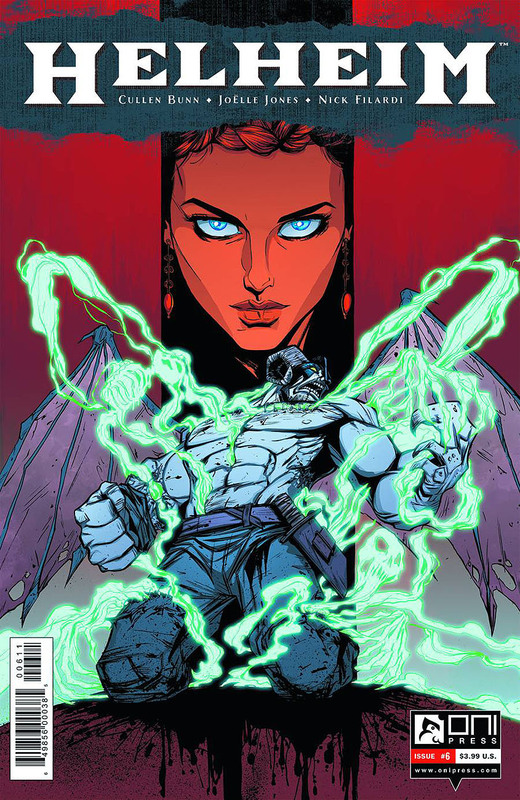 Artful Daggers #6 - This Mokeybrain title from Sean Williams and Adam Knave really picked things up this week. The Tricksters are finally becoming what the corporations feared what they would become. An uprising is in the works, but the amount of deception and lack of trust amongst members will ensure that nothing is easy. One of the best bargains on the comic market today at only $.99 an issue. You could pick up the current arc on ComiXology for less than $6! Ten Grand #4 - Following an emotionally charged issue, Joe is presented with a new challenge that shakes him to the core. For the first time since he struck his bargain, he is unable to reach his angel on the other side. Enlisting the help of a trapped soul, Joe learns that not only is his angel missing, but Sarah's soul is missing as well. Really enjoying this series. Manhattan Projects #13 - I really want to return to this series at some point, and it sounds like I missed a great issue. Fictional versions of Einstein and other World War II era scientists are featured in this flashback issue. Satellite Sam #2 - Mike is not only dealing with the loss of his father, but with the pressure to fill in as his replacement. He turns to the bottle and the story switches focus to the owner of the station, adding another wrinkle in this ever complicated period piece.